The next instalment of Chapters Eight to Fifteen promises even more mystery and intrigue, and in anticipation of this we’ve devised a series of audio and visual Teaser Questions based on details from the upcoming Moments on Pottermore.com. Starting tomorrow, Friday March 15, a Teaser Question will be posted every day for the next ten days at 16:45 (GMT) on the Insider and at 17:00 (GMT) on our Facebook and Twitter pages. These will increase in difficulty each time: some will challenge your attention to detail, some will require a good knowledge of the book, and some need only imagination and wild guesswork. One – things are not always what they seem in Harry Potter and the Prisoner of Azkaban, and nor are they in our Teaser Questions. Two – look out for hints here on the Insider, and on our Facebook and Twitter pages. Three – get help or help others by joining the conversation and sharing your thoughts, whether in the Great Hall, your common room, or on our Facebook and Twitter pages. If you follow us on Twitter, you can use the hashtag #pmteasers. Four – consult your copy of Harry Potter and the Prisoner of Azkaban to jog your memory or provide inspiration. For now we are keeping the answers a secret, but all will be revealed soon enough. 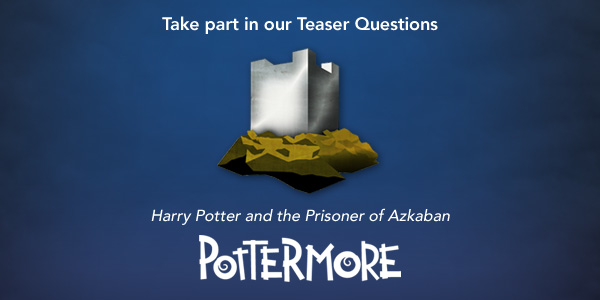 I'm quite excited, because I think it's neat for them give teaser questions before the release to discuss about the questions during this 10 days, keeps us entertained before the release of the next instalment...since Teaser questions ends in 24th March, then maybe Monday 25th or Tuesday 26th will release part 2 of Prisoner of Azkaban.